First, it checks your code to make sure it follows the rules of the C++ language. If it does not, the compiler will give you an error (and the corresponding line number) to help pinpoint what needs fixing. The compilation process will also be aborted until the error is fixed. Second, it translates your C++ source code into a machine language file called an object file. Object files are typically named name.o or name.obj, where name is the same name as the .cpp file it was produced from. C++ compilers are available for many different operating systems. We will discuss installing a compiler shortly, so there is no need to do so now. First, to take all the object files generated by the compiler and combine them into a single executable program. Second, in addition to being able to link object files, the linker also is capable of linking library files. A library file is a collection of precompiled code that has been “packaged up” for reuse in other programs. The C++ core language is actually fairly small and concise (and you’ll learn much of it in these tutorials). However, C++ also comes with an extensive library called the C++ Standard Library (usually shortened to standard library) that provides additional functionality that you can use in your programs. One of the most commonly used parts of the C++ standard library is the iostream library, which contains functionality for printing text on a monitor and getting keyboard input from a user. Almost every C++ program written utilizes the standard library in some form, so it’s very common for the standard library to get linked into your programs. Most linkers will automatically link in the standard library as soon as you use any part of it, so this generally isn’t something you need to worry about. You can also optionally link in other libraries. For example, if you were going to write a program that played sounds, you probably would not want to write your own code to read in the sound files from disk, check to ensure they were valid, or figure out how to route the sound data to the operating system or hardware to play through the speaker -- that would be a lot of work! Instead, you’d probably download a library that already knew how to do those things, and use that. We’ll talk about how to link in libraries (and create your own!) in the appendix. Third, the linker makes sure all cross-file dependencies are resolved properly. For example, if you define something in one .cpp file, and then use it in another .cpp file, the linker connects the two together. If the linker is unable to connect a reference to something with its definition, you’ll get a linker error, and the linking process will abort. 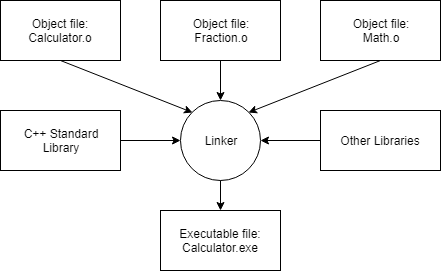 Once the linker is finished linking all the object files and libraries (assuming all goes well), you will have an executable file that you can then run! For complex projects, some development environments use a makefile, which is a file that describes how to build a program (e.g. which files to compile and link, or otherwise process in various ways). Entire books have been written about how to write and maintain makefiles, and they can be an incredibly powerful tool. However, because makefiles are not part of the C++ core language, nor do you need to use them to proceed, we’ll not discuss them as part of this tutorial series. This is the fun part (hopefully)! You are able to run your executable and see whether it produces the output you were expecting! If your program runs but doesn’t work correctly, then it’s time for some debugging to figure out what’s wrong. We will discuss how to test your programs and how to debug them in more detail soon. 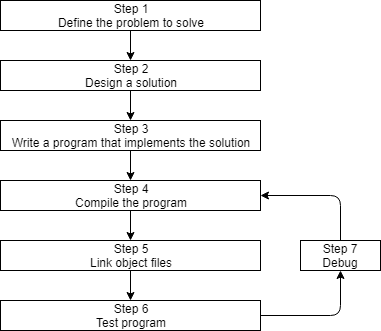 Note that steps 3, 4, 5, and 7 all involve software (editor, compiler, linker, debugger). While you can use separate programs for each of these functions, a software package known as an integrated development environment (IDE) bundles and integrates all of these features together. We’ll discuss IDEs, and install one, in the next section. Grateful reader here. I've heard this phrase that we cannot debug some issue because "we don't have the symbols" for some library (e.g. when stepping through code). What does that mean? Is that related to having the source code? When compiling C++, pretty much all information about the source code is lost, because your computer doesn't need to know how you named things or what your file structure was. In debug mode, symbols can be added to the binary. Those are the names of functions, variables, etc., which of course help immensely when debugging. You can still debug programs without symbols, but you'll have to figure out what is what on your own. I'm loving this tutorial, ty so much for this. I have some question tho. Is it ok if i print it? I'm making a "summary", don't know the right word for it, as i study these. At the end i'm gonna have what i wrote down from the tutorial and i think it's wise to also have the source stored with it. I know its silly to ask but i just feel like i should. Also, i bought this book "C++ Primer Plus - 5th Ed - PHE - Pearson Higher Education" to help me with the learning. Is it a good idea to use it as i go through the tutorial. Ty again so much for this :D.
You are free to print the tutorials for your own personal use, so long as you do not distribute them. :) Have fun! It's always best to learn from multiple sources, as they will give you different perspectives. I would never do that. Again, thanks a lot for this :D. I don't have a credit card to donate :(. Any other way i can donate/help? If you see any typos or omissions, point them out. That helps me improve the tutorials for everyone! "If the linker is unable to connect a reference to a thing with the definition of that thing, you’ll get a linker error, and the linking process will abort." "If the linker is unable to connect a referenced thing with its definition, you’ll get a linker error, and the linking process will abort. assuming I'm n't interested in other libraries and i want to build my own independent OS, can i possibly write my own code to implement it with my own libraries/code without those libraries? Sure. You can avoid use of any of the code in the standard library (or any other library) and only use the code you've written yourself. This generally isn't recommended, because the code in the standard library is useful and tested, and using it will dramatically shorten the time it takes to write functional programs. Ah, the English language is alive and well as long as we have people like Ryan! And with such great attention to detail, I expect that you’ No slouch as a programmer. Hello! I just wanted to point out a couple small typos I noticed. In the Step 5 section, you used 'a' instead of 'an' in "However, C++ also comes with a extensive library". In the box at the bottom, I think you meant to say something like 'describing', or 'which is a file that describes' in "which is a file describes how to build a program". Typos fixed. Thanks for pointing these out!